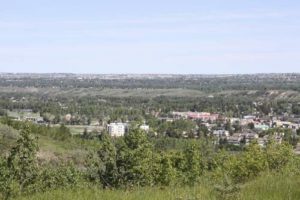 Sitting on the hill above Sarcee Trail, Patterson is one of Calgary’s most unique communities. The SW Calgary community has amazing views of the city, unique properties and easy access to downtown and nearby amenities. View all the homes for sale in Patterson here, and read more about this special community below. Patterson is located to the west of Sarcee Trail and can be accessed via Old Banff Coach Road. Patterson real estate includes detaches houses and unique condos. The closest communities beside Patterson are West Springs (on the other side of Old Banff Coach Road), Strathcona Park (to the south) and Cougar Ridge. Sweeping views of the Bow River valley from the SW Calgary community of Patterson. Patterson’s notable history has contributed to its unique character. A transmission towers constructed in the neighbourhood led to the name “Broadcast Hill.” It is now called “Patterson” after a family that owned many properties in the area before the community was annexed by the City of Calgary. Patterson was the intended site for the University of Alberta, but that changed when the university was build in Edmonton. For the 1988 Winter Olympic that were hosted in Calgary, Patterson was the site of the Broadcast Hill Media Village. Those apartments are now condominiums. CTV Calgary still broadcasts from its studios in Patterson. 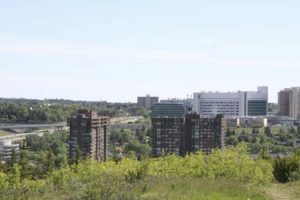 The view from Patterson includes Nose Hill Park, the University of Calgary, Foothills Hospital, downtown and beyond. There are many parks in and nearby Patterson. Most notably is Edworthy Park, located across Sarcee Trail. Patterson is part of the Coach Hill Patterson Heights Community Association. A shopping centre in the community has a pub, shops and services. There is easy access to the foothills and mountains via Old Banff Coach Road. Getting to downtown is also easy, whether by car or by transit. Calgary Transit buses run through the neighbourhood and connect with the 69 Street LRT station. 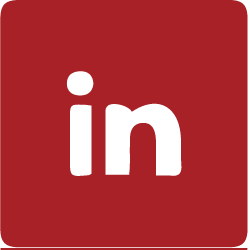 For more information about this unique community, contact us today! And see all the homes for sale in Patterson above.